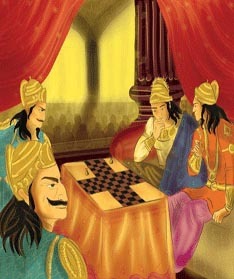 The Great War of Mahabharata between the Pandavas and the Kauravas happened in 3139 BC, and it was triggered by a game of dice between the proud Yudhishthira and envious Dhritarashtra via their cunning uncle Shakuni. The war is a manifestation of good prevailing over bad (unlike the Iliad which is over a woman); however importantly it is a wrapper for the Holy book of the Hindus: The Bhagavad-Gita, wherein Lord Krishna parts with the essence of man, his being and his duty. Why not come in for a guided tour to look around the Temple and learn about many Hindu Gods and Deities? The Panditji(priest) will be glad to show you around during the day. Students are always very welcome. The temple is open for school visits on weekdays between 10 am - 5 pm.